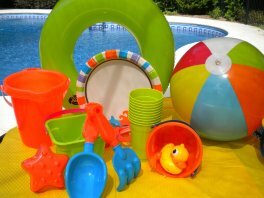 Looking for pirate birthday party ideas that will take your mates onto the "deep" seas of your swimming pool? Furnish your mateys with pirate names, eye patches, swords, and pirate hats. 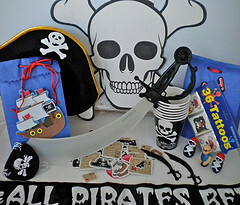 What fun we had getting our pirate birthday supplies - eye patches, swords, stickers, cups, flags and more. Most of the pirate birthday party supplies we bought on line to save time and money. You can provide a simple inexpensive pirate wardrobe for all the guests like pirate hats, swords, eye patches, or bandanas. If you'd like to go all out with pirate props - there are treasure chests, pirate flags, gold coins and more. 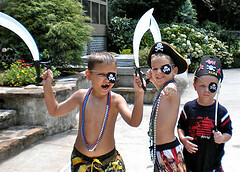 A pirate birthday party is a cool pool party theme that will be a party to remember. The invitation sets the theme. It doesn't take a lot of time or money to get creative. 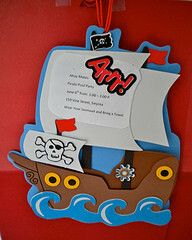 Here are some pirate party ideas for invitations. Get creative and use a cardboard treasure chest with some gold coins, a silk black pouch, a worn and wrinkled treasure map in a bottle or a pirate flag. We used a foam sticker kit of a large ship and added some pirate stickers to it. 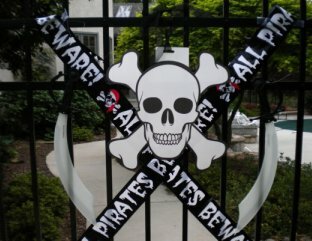 Start your pirate decorations at the pool gate. This let's the guests know that they are entering pirate territory. Scatter gold coins or foam stickers of coins and jewels along the path or sidewalk to the pool area. We could hear the kids excitement as they "found" and picked up their treasures. Plastic swords can be hung from branches or umbrella ribs. Make signs on ripped pieces of cardboard attached to a wooden dowel and put them in the ground. Signs can say things like "Surrender the Booty" or "Pirates Only: NO Trespassing." Send your pirates on a race to get their hidden treasures. Provide one inner tube for each team. 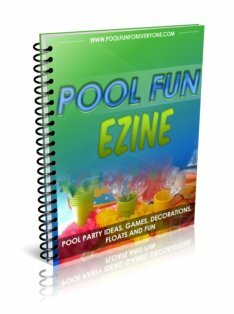 Each team member takes a turn and while sitting on the inner tube kicks and splashes to get to the other side of the pool where there is a pile of necklaces waiting for them. After grabbing one necklace the player returns to his team where he tags the next team mate to do the same. Pirates "Walk the Plank" and "Swab the Deck" with these pirate party games. 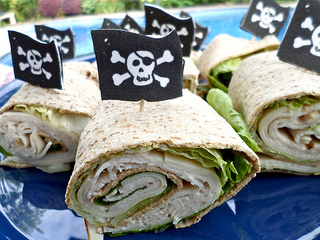 Turn ordinary food into pirate party food just by how it is presented. 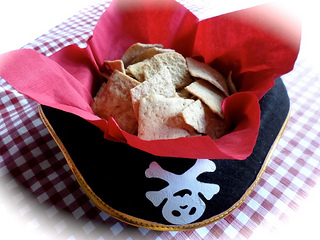 Serve chips in an upside down Pirate hat lined with a red napkin. Serve chips, Chex Mix, Gold Fish or a nut and raisin mix in Pirate themed paper cups. 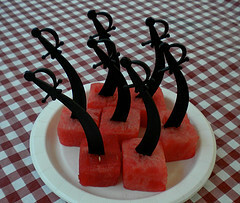 Sword food picks inserted into cut up pieces of fruit or cheese are simple ways to decorate the food and yet simple to do. An inflatable treasure chest can be used to keep drinks or food cold or as a decorative prop. 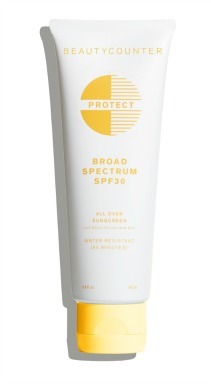 It measure 26" long, 16" tall and 14 1/2" deep when it is fully inflated. It holds about 60 cans. These gold coins are pirate themed and can be used in the party bags, to decorate the party table or for treats during the party. 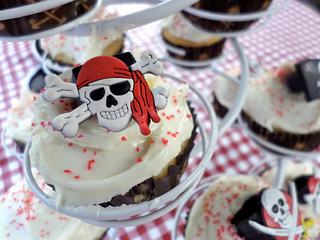 A pirate birthday cake is made easy by making cupcakes. 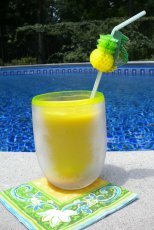 If you are like me, you want to make something that's fun for the kids and easy to make. 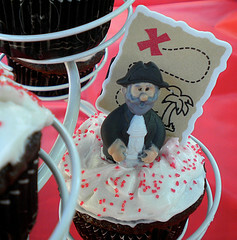 Finger puppets and rubber pirate rings all make great toppers for cupcakes. 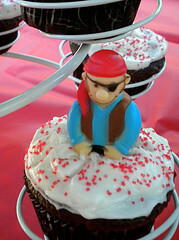 Pirate themed cupcake liners and pirate rings turn ordinary cupcakes into something fun and creative, and most important, easy and inexpensive. Use these colorful rubber rings to top your cupcakes. The kids love them as much as they do the cupcakes. Use plastic finger puppets as cupcake toppers and sprinkle some red sugar crystals on white frosting for a pirate birthday cake and take home party favor. 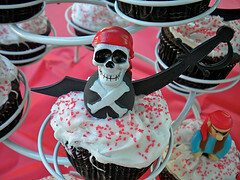 Pirate decorated cupcakes displayed in a Cupcake Stand can be used as pirate decorations. Set the cupcake tower on the food table as the centerpiece. Ordinary food becomes extra-ordinary by just using pirate themed serving pieces, swords and finger puppets.